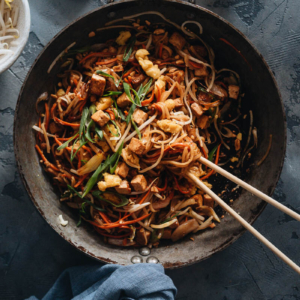 After mastering a few Chinese dishes, it’s time to show off your skills to your family and friends! It allows you to host host 4 to 8 people. Every single dish is carefully selected with maximum deliciousness guaranteed. You can prepare most of the dishes ahead of time, so you don’t need to be running around in the kitchen on the day of the party. You can use my small tips on workflow to help you serve everything hot. Today’s theme is Chinese takeout at home! This menu is a great introduction to Chinese food for anyone new to the cuisine. It contains the classic orange chicken that everybody loves. 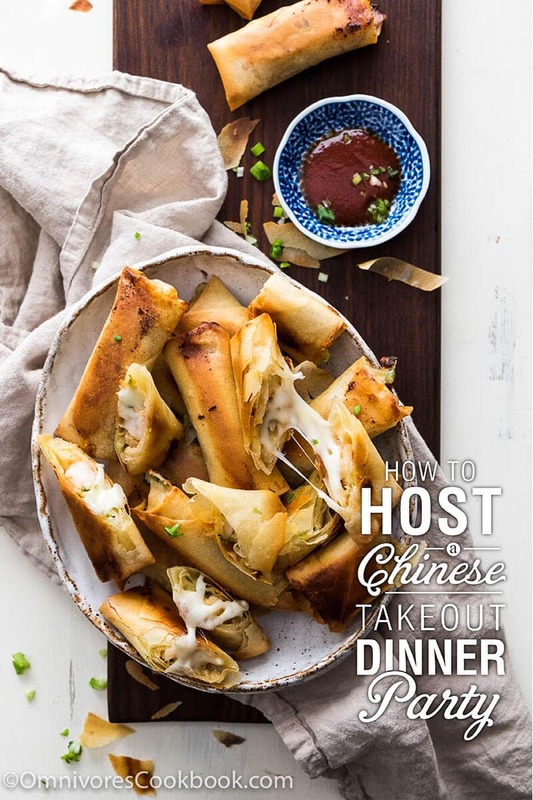 I picked the cheesy crispy spring rolls as the appetizer, because they are one of the most popular party foods on my blog. Just like ordering takeout food in Chinese restaurant, we serve fried rice and egg drop soup on the side. I also picked a veggie dish to add color to your table. 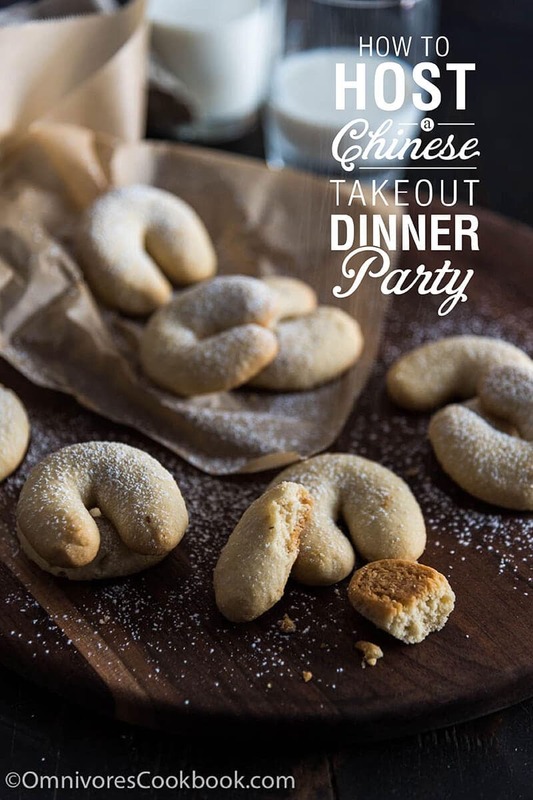 The dinner will finish with butter almond crescent cookies that are shaped like fortune cookies. Let’s jump in and look at how to prepare each dish for your big party! 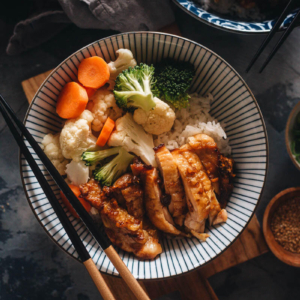 Serve 4 people – If you cook every dish from this menu by following the recipes, you will get a good size meal for four people with potential leftovers. Serve 6 people – Double the serving of egg drop soup and orange chicken. Follow the rest of the recipes as written. 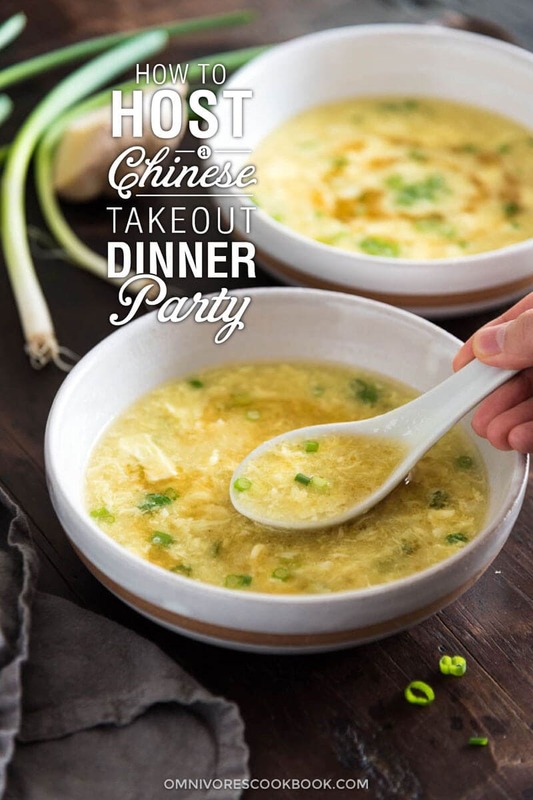 Serve 8 people – Double the servings of egg drop soup, orange chicken, and fried rice. Follow the rest of the recipes as written. You can choose to skip the roast asparagus or the cookies, if the number of dishes stresses you out. If you skip the asparagus and would like to add some veggies to your meal, add a handful of baby spinach to your egg drop soup at the end of cooking. If you skip the cookies, buy some fresh fruits and make fruit bowls to serve at the end of the meal, as a dessert course. It is the real Chinese way of serving dessert at any dinner party. Once you’ve decided which dishes to cook, go to each recipe by clicking on the title of the recipe and print it out. Then make your grocery shopping list and gather all the ingredients. These crispy rolls do not require deep frying, pre-cooking of the filling, and are baked. So they are much easier to prepare than traditional spring rolls. Get the wrapping and cooking done a day ahead by wrapping these rolls without baking. Then you only need to reheat the rolls in the oven right before serving and they will remain crispy. This is the dish that you do want to make right before serving, so the chicken will be crispy and hot. But you have another option to prepare everything ahead of time. 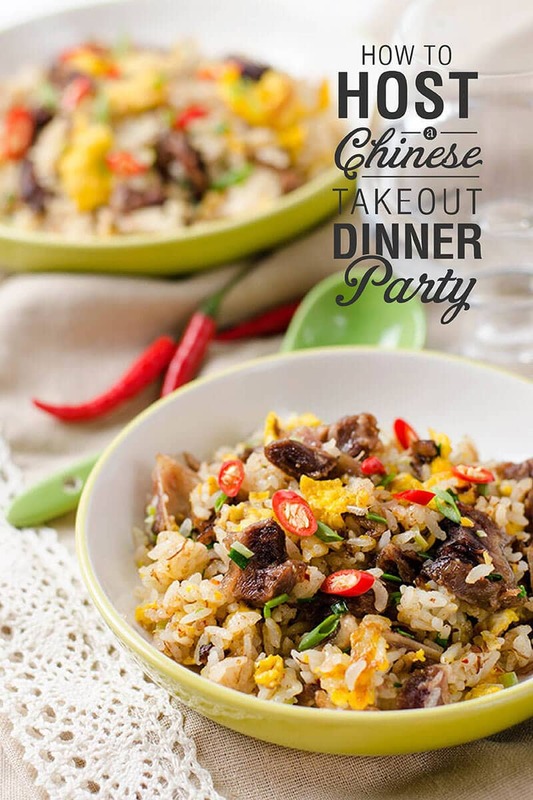 Option 1 – To serve the dish with the best result, you should get the prep done a day ahead or on the same day of the party, then cook the stir fry right before serving. Chop the aromatics and put them in a small container. Marinate the chicken without adding cornstarch. Mix the sauce and store it in a small jar. Right before serving, cook the dish according to the recipe and serve immediately. Option 2 – To eliminate the stress of cooking during your party, you can cook the chicken and the sauce separately, ahead of time. When you are ready to serve, reheat the chicken in a 350 degrees F (176 C) oven for 10 to 15 minutes, and reheat the sauce in microwave. Toss everything together in a big bowl and serve immediately. The chicken won’t be as crispy as the result of option 1, but it will be decent enough to serve at a dinner party. This method is super helpful if you serve a larger crowd, such as 6 to 8 people. Cook the dish a day ahead and store it in a container in the fridge. Reheat it in the microwave right before serving. You can use any leftover or deli roast beef in this recipe. You can also use rotisserie chicken to change it into chicken fried rice. This fried rice tastes much better than your usual takeout fried rice because it’s much more flavorful. Roast the asparagus a day ahead and store it in a container in the fridge. You can reheat it in the microwave or in the oven (after you reheat the spring rolls). Although egg drop soup is a dish that can be cooked ahead of time, I actually prefer to cook it before serving.The cornstarch we use to thicken the soup will lose potency once stored in the fridge, so the soup might turn watery when you reheat it. If you get the prep done, it only takes 5 to 10 minutes to cook the soup. Then you can serve the perfect hot soup to your guests. If you want to prepare the soup ahead, you need to reheat it in a pot on the stovetop. If the soup thins out during reheating, you can mix more cornstarch and water to make the slurry, and thicken the soup again. This is one of my favorite cookie recipes because it’s so simple to make and the flavor is classic enough for almost anyone to enjoy. Again, if you don’t want more workload on top of your dinner party planning, simply serve some chopped fruits, or purchase any dessert you prefer. (1) Preheat your oven to 350 F (176 C). (2) Twenty minutes before serving, spread the spring rolls on a large baking sheet and place in the oven. Reheat for 10 to 15 minutes. Serve them as the first course. (3) If you have cooked the egg drop soup, you can reheat it now. Or you can start cooking the egg drop soup now. Once done, cover the pot while you prepare other dishes. 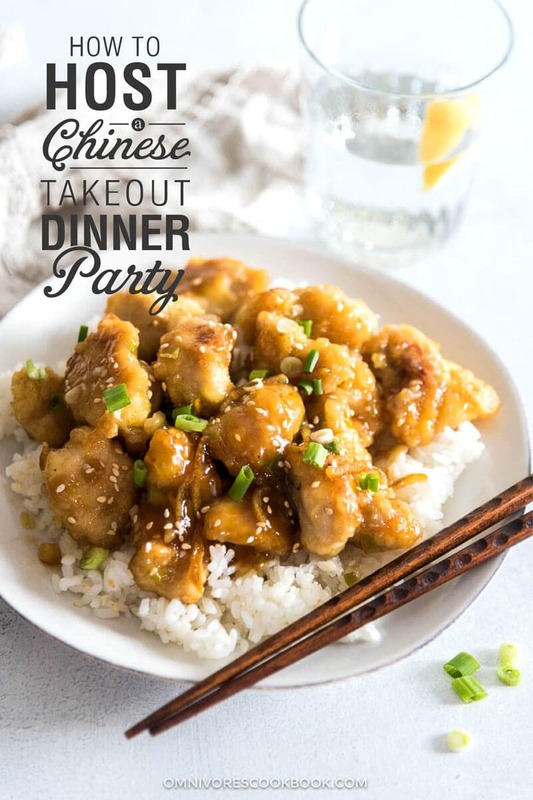 (4) If you have cooked the orange chicken according to option 2, you can reheat the chicken immediately after you serve the spring rolls, for 10 to 15 minutes. (5) Meanwhile, reheat the asparagus in the oven, for 6 to 8 minutes. (6) If you are cooking the chicken according to option 1, now is the time to cook it. (7) Reheat the fried rice in the microwave, for about 1 minute per serving. If you reheat the rice in a large container, heat it for 3 to 4 minutes, stir and flip, and continue to heat until the rice is warmed up evenly. 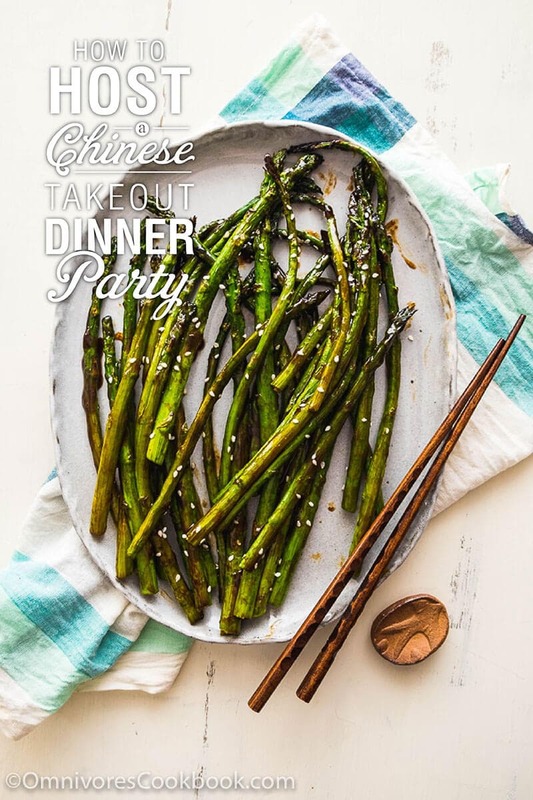 (8) Once the chicken is done, and the rice and asparagus are reheated, you can (1) serve all the dishes family-style by presenting everything on the dinner table. Or (2) transfer each serving onto a big plate and the soup into small bowls. Serve immediately. (9) Serve the dessert (cookies or anything you prefer) after the main course. Hosting a multi-course dinner for a crowd is a lot of work, and it can be stressful. 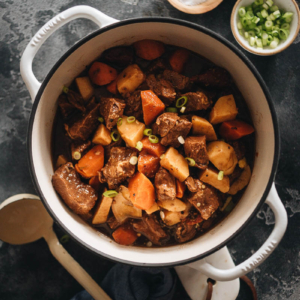 However if you plan it ahead and get most of the cooking done, the party day is quite manageable even if you need to do everything by yourself. Is there another dinner party theme that you’d like to learn? Leave a comment below to share your thoughts, so I know which dinner menu I should work on next! 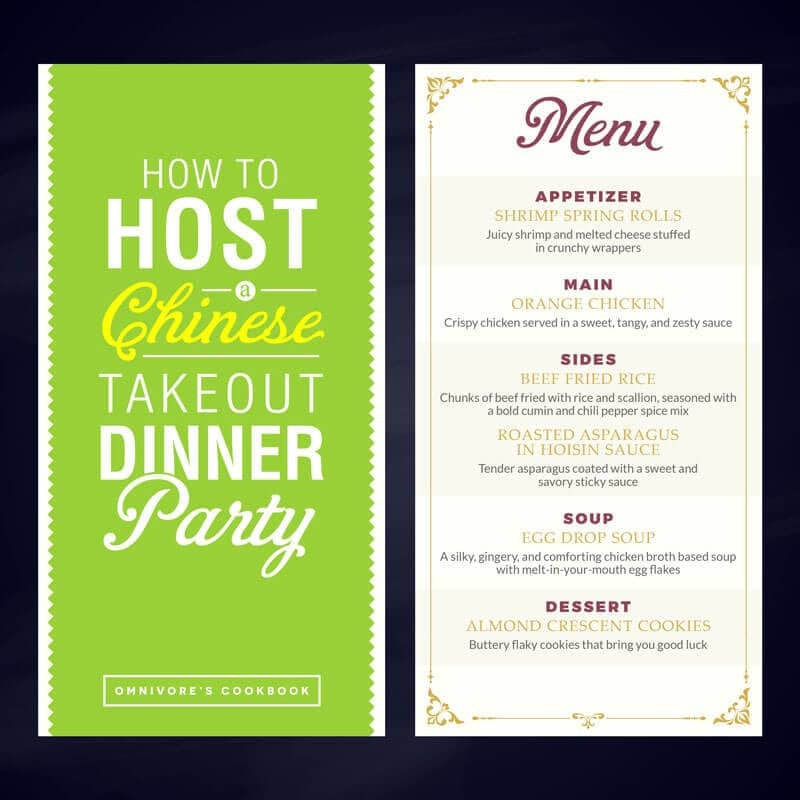 If you host a Chinese dinner party according to this menu, let us know! Leave a comment, rate it (once you’ve tried it), and take a picture and tag it @omnivorescookbook on Instagram! I’d love to see what you come up with. Wow! What a great step-by-step plan. I love the presentation. What a fantastic post! Very balanced menu and each dish is a star on its own. 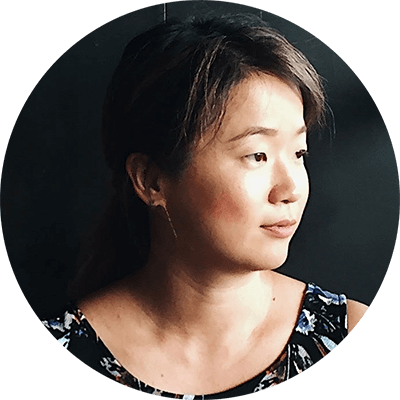 Work out a detailed workflow–this is exactly what I do when preparing a dinner party. It makes the preparation stress-free. Look forward to more dinner party posts! This all looks so yummy! 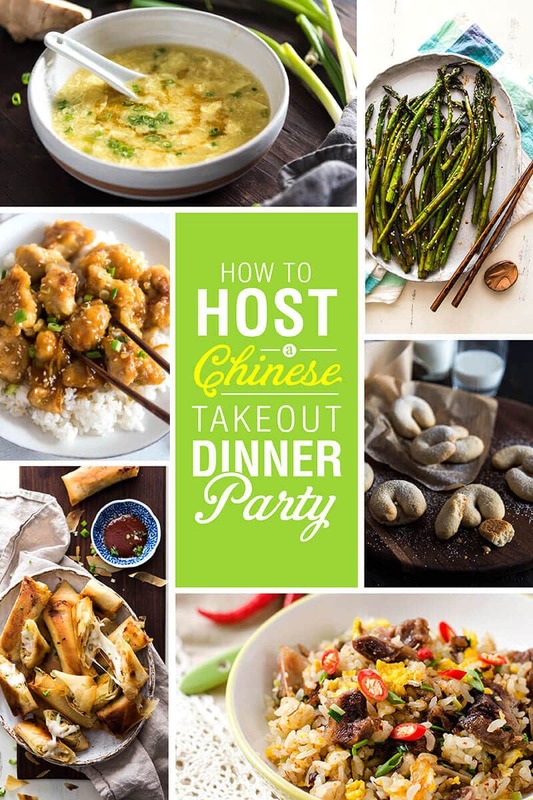 It would be so fun to have a Chinese food dinner party. My husband and I love to host and this would be the perfect excuse! However, for our busy schedules, it may be better that we find a restaurant that we could pick up some take out.